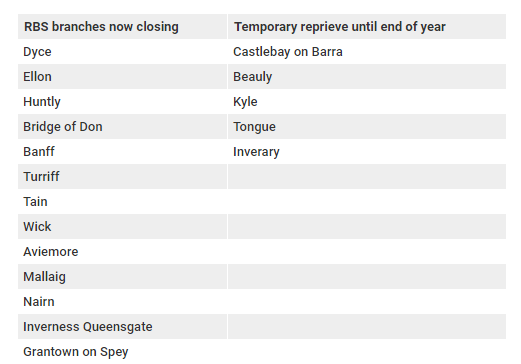 The committee has been investigating the plans, which has already seen 13 local branches start to close their doors and five more win a stay of execution until the end of the year following the P&J’s Save our Banks campaign. Having grilled RBS executives and banking experts, the committee has released a damning report, which states the bank has “singularly failed to appreciate how devastating” the closures will be to communities in Scotland. MPs have recommended the UK Government uses its influence as a majority shareholder in the bank to pressure executives over their plans, which it says are based on “flawed assumptions” about customer needs. The push towards online services “cannot provide an adequate service in areas where broadband can be patchy or non-existent” and RBS mobile banking vans and community bankers would not provide an adequate range of services, nor adequate access, MPs said. The report concludes that if RBS “truly wants” to meet the needs of its customers, bosses should respond to the committee’s “overwhelming evidence” showing a continuing strong demand for branch services and halt the closure programme. MPs also demanded clarity about how the 10 branches being kept under review would be judged and by which organisation, and called for the review to be extended beyond the end of the year due to the lack of information. Committee vice-chairman John Lamont said RBS appeared to be “clueless” about how “angry and betrayed” its customers felt and the UK Government should be “standing up for communities”. 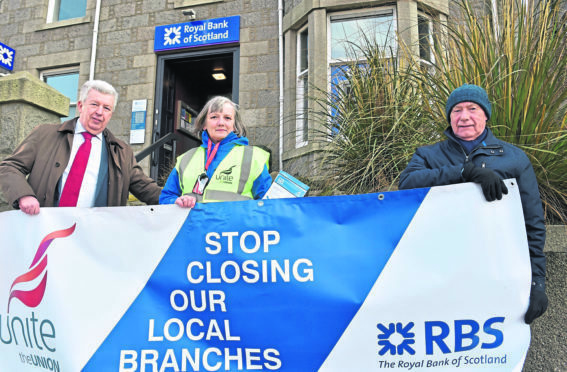 He said: “After the pathetic excuses we heard from Ross McEwan, the chief executive officer of RBS, the committee was forced to conclude the bank is clueless about how its branch closures will affect communities in Scotland. “RBS needs to look again at this decision, if only to reflect on the impact it is having on their brand image. “RBS customers from across Scotland who we have spoken to feel angry and betrayed by the bank, something which bank bosses appeared completely unaware of. An RBS spokeswoman said she wanted to reassure customers and MPs the bank did understand closing branches “can be difficult for some customers and colleagues”. She claimed branch usage had fallen 44% since 2011 and seven in 10 customers were using mobile or online banking. “It’s not an easy decision,” she said. “We have listened to customers, colleagues, communities and elected representatives and welcome the committee’s recognition that we have engaged and responded. “The way our customers are banking is changing and it is important that we respond to that change. “We recognise that every customer will have different banking needs and we are committed to ensuring all our customers receive the best possible service. The spokeswoman added the 10 branches under review would have closure “reconsidered” if there were “sustainable transactional increases and viable new income” and more details of a full, independent review would be published in the coming weeks. A Treasury spokesman insisted the UK Government had no intention of intervening or pressuring the bank, despite being a majority shareholder, and would ignore the committee recommendations. “But we understand the impact that closures can have on communities and people’s jobs.